Yesterday, this happened: I re-installed macOS Sierra. Today, all apple processes related to wifi/network crashed. When I opened system preferences, the app was fine, but as soon as I opened the network pane, it crashed. Whenever I put my mouse over the wifi menu in the menu bar, my mouse just spun infinitely. Carrot weather, in the sidebar, also crashed, leading me to think that anything related to wifi had crashed. 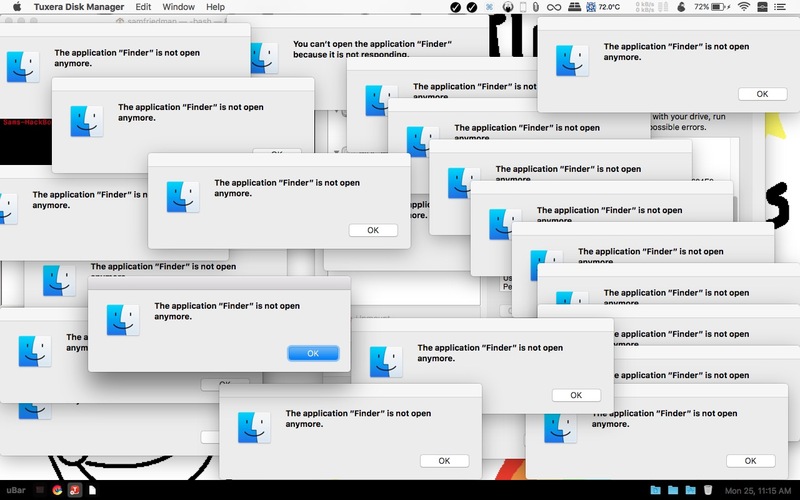 This is basically what happened in the screenshot, except I tried to relaunch finder, and when finder wouldn't launch tried launching it from the menu bar. I'm pretty sure that the (relatively new wd) ssd is fine (SSDReporter said it was, and diskutility didn't find any errors), so what can the problem be? Restarting seems to temporarily fix the problem. MacBook Pro, mid-2012, 16gb ram, data doubler instead of superdrive. Do I need to replace the wifi card? TL;DR: macOS seems to be crashing, may be related to wifi. Browse other questions tagged macos macbook crash internet . How to show all running processes on macOS/OS X? How to drag files into an app's Dock icon in macOS Sierra?